Madison, Wis. - The Youngstown State cross country team finished an impressive 15th place at the NCAA Great Lakes Regional Championship held on Friday at the Thomas Zimmer Cross Country Course. Junior Ryan Sullivan ran a masterful race finishing with a school-record 10k time of 31:20.9 to place 32nd. 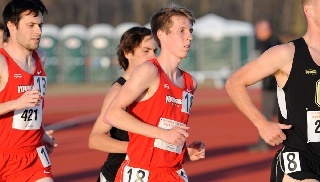 The previous school best time in the 10K was Austin McLean at 31:29. Sullivan's previous best 10K performance was at last year's Great Lakes Regional (32:12). Senior Ethan Wilson posted the best 10k time of his career with a 32:10.5 that placed him 74th. Finishing 102nd was freshman Tristan Dahmen who posted a time of 32:37.14. Running a 32:42.3 in the race to finish 107th was junior Dylan Dombi while junior Alan Burns batted through a foot injury to finish 123rd with a time of 33:08.2. Sophomore James Nedrich was 128th wtih a 33:12.2. YSU had a total of 438 points and was just 11 behind Notre Dame. Winning the team category was Wisconsin with a 51 while Michigan State was second and Indiana third. YSU had two runners in the women's race in McKinsie and Michelle Klim. McKinsie Klim posted a time of 21:37.3 to finish in 68th place while Michelle Kilm had a 22:21.9 to place 115th.